There are loads of single blade/ open canoe paddles. This page is to help unravel some of the mystery of which one and what for! Like canoes optimum paddle shape and length depends on purpose. For most paddlers, choice of paddle is a compromise between the various uses we put them to. However, it is good practise to have a spare paddle. For white water paddlers the choice is often a wooden paddle for flat water sections and a strong nylon headed paddle for rapids and shallow water. For others with less interest in moving water, a long bladed touring paddle does for deep water and a shorter one for shallow. If you are limited to one paddle, many paddlers would recommend the classic beavertail. Our version is called the Huscarl. Simply put, a shorter broader paddle head can provide more instant power per stroke but is more tiring to use. A smaller headed paddle can’t generate the same amount of power per stroke but doesn’t wear you out so fast. Racing a canoe over a shorter distance or white water paddling both benefit from short, broad paddle heads, whilst touring or longer trips are more comfortable with longer narrower blades such as the ottertail. There are some additional key points to take into account with regard to the shape of the paddle head. Shorter heads are more suitable for shallow and rocky areas where short faster strokes may be required, whilst longer blades are useful in deeper water where the blade can reach into the less turbulent water below the surface and where fast stroke speed is less necessary. When using a long bladed paddle, the stroke tends to be slower and with a more gradual application of force. This feels and looks more peaceful and can be less wearing on the wrists and shoulders. Typical long bladed paddles include the Valkyrie Viking and the Thane, short bladed paddles include the Beavertail and the Scout. Racers tend towards using a crank shafted paddle. Having a paddle of the correct length makes a significant difference to the pleasure of paddling. Too long and it is difficult to manage the paddle’s entry and exit, and too short reduces leverage and paddling becomes hard work. Another consideration is that some argue bow paddlers tend to need a slightly longer paddle for reach and power while others say stern paddlers need a longer paddle for steering and leverage!! However, we change all sorts of body dimensions in an average day in the boat by sitting straighter, leaning forward, and making changes to our kneeling position, so this is not an exact science, and of course there is also individual personal preference. 1. 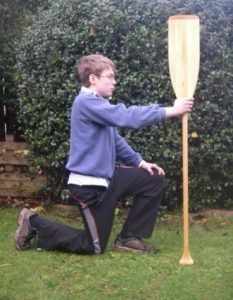 A guide to personal paddle length is to kneel down and hold your arm out so that it is parallel to the ground. The distance from the bottom of your fist to the ground is the paddle shaft length you need. The image to the left shows this method. The logic of this is that this position mimics the power stage of the stroke – top hand is extended level holding the grip which puts the blade below the level of the floor ie. under water. 2. Another is to sit upright in a chair and have someone measure the distance from the seat to your eyebrows. This measurement equals an approximate recommended shaft length. Both produce pretty different measures!! At valkyrie Craft we work on method 1. Note#. Using the method where you stand and choose a paddle that comes to the level of your shoulder is not useful . . . it entirely ignores the length of the blade!! Some people would choose to have a slightly shorter shaft when buying a long bladed paddle. The most common materials used to make recreational canoe paddles are solid wood, laminated wood, plastic blade with aluminium shaft and nylon blade with alloy shaft. Plastic paddles can be made of polypropylene, polyethylene, or nylon. They are low-maintenance and cheap but certainly not pretty, and both polypropylene and polyethylene can also be prone to the blades snapping. Nylon blades are tougher but heavier and are often used for white water paddling where impact on rocks is more likely. Alloy / metal shafts vary widely; some are robust, whilst cheaper versions can be prone to bending and kinking. Invariably they are also cold to the touch. Many paddlers buy plastic paddles initially but soon upgrade to a wooden paddle, keeping the plastic paddle as a spare. Wood is unmatched by any synthetic material in its liveliness, flex, and warmth in the hands. However, wooden paddles vary enormously in terms of their strength, durability and weight. Solid wood paddles are made from a single piece of wood, which can make them vulnerable to splitting and warping. Laminated paddles are made from strips of wood bonded together with glue, which makes them stiffer and therefore better for power transfer in the water, but they can also be prone to snapping or splitting along the laminates. In general, paddles made from hardwood have the advantage of durability but are heavier, while softwood paddles are lighter but less durable. Valkyrie paddles are made of a combination of Western Red Cedar and hardwood laminates giving them a good weight to strength ratio. They are then reinforced with an epoxy resin tip, which means they are less prone to splitting along the grain and have a hardwood edge which makes them much more durable. Valkyrie paddles have been designed to be lightweight, strong, warm and flexible through the combination of materials and construction. We select wood for its appearance and light weight, laminating it with high strength glues. In this way we have taken the various positives of the materials and combined them to produce what we feel is the perfect paddle. Valkyrie Paddles Page.